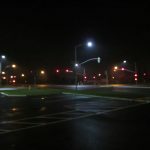 The expansion has two components: terminal expansion, and parking expansion. Let’s talk about parking first! Click to read more! 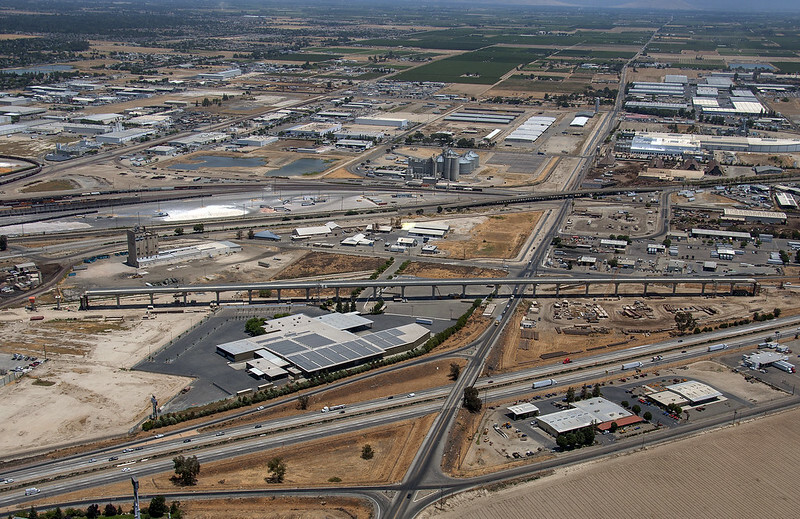 One big question has been: what destination is missing from Fresno? United answered that question in part last year by adding trial service to Chicago on an Embraer 175 operated by Skywest. This route was somewhat noticeable because it became one of the longest flights in the US operated by a small regional jet. 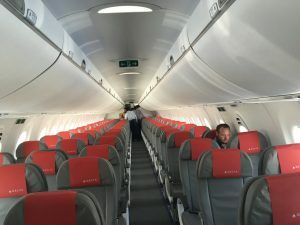 Well, the test proved successful, and United will again operate flights to Chicago in 2019, but this time with a full-sized plane (A319). However, service will still be summer-only. In 2017, United also increased their service to Fresno by upgrading San Francisco to a mainline jet. Click to read more! 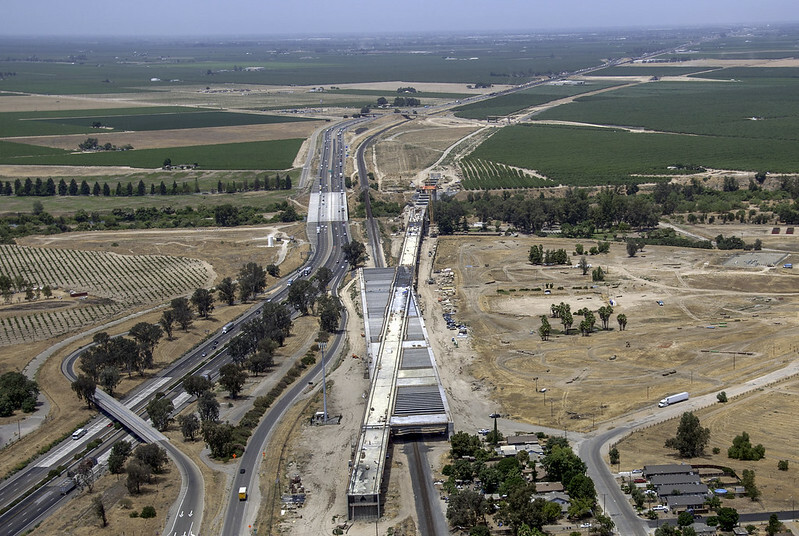 The California High Speed Rail Authority used to post videos every month or two summarizing their construction progress. Unfortunately, that ended around October of last year. Now they’re back with a new video highlighting what has been going on. At under four minutes, it’s a good watch. While they’ve been stingy with their videos, they have continuously updated their Flickr account. Usually new photos go up every 3-5 weeks. Here are some of my recent favorites. I especially like the ones from angles I cannot get myself. 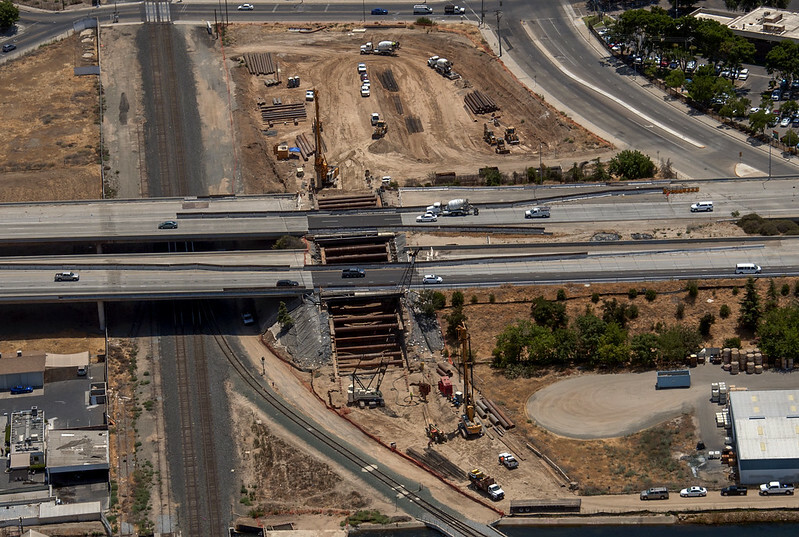 I’m hoping that in 2019, we see these various construction sites linked up with rails and walls. 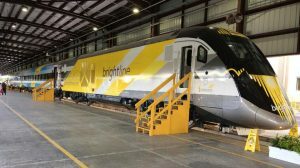 I think that once that happens, the project will really seem to be real, even though we know train service is still far away. 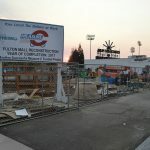 Additionally, one other major piece of infrastructure was recently “finished,” and that’s the train station in San Francisco.Or at least the box where it goes. Streetsblog has a tour here. Of course, I wish this all was moving faster. But it’s still nice to see that it is moving at all. 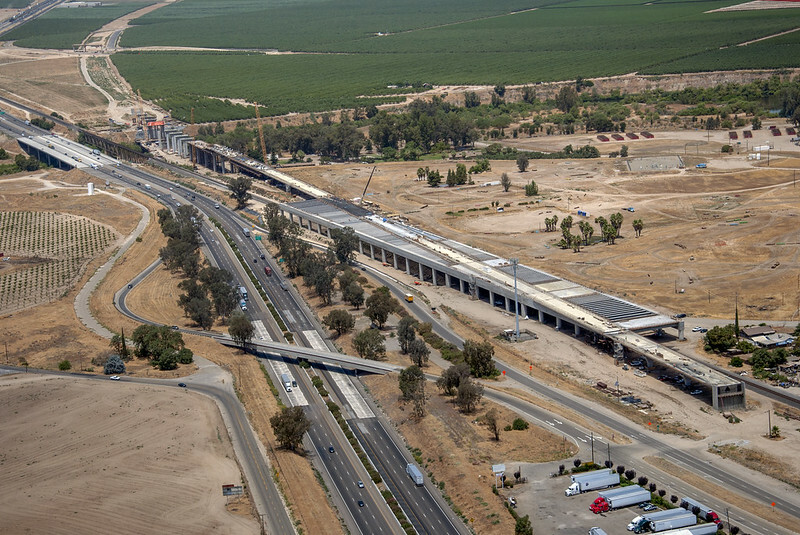 The Riverside County Transportation Commission (RCTC) has been studying passenger service in a 141 mile rail corridor between Los Angeles Union Station and Indio, CA since 1991. 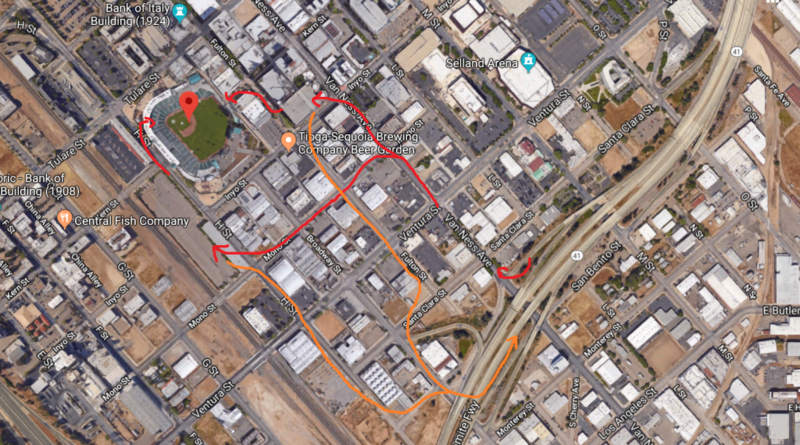 One such proposal I’ve seen a lot about involves a big increase in rail service in the northern part of the San Joaquin Valley including shifting the Amtrak San Joaquin over to a completely separate rail line into Sacramento, adding a bunch of stations, and increasing service. Cool stuff, but it’ll never happen, right? 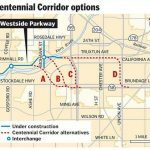 Well, earlier this year, those plans were granted $500 million. Five hundred million! 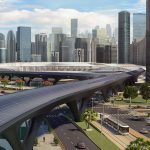 That’s real money to turn the plan into an actual operating rail line, so it’s time to take a very serious look at what is actually going to happen. 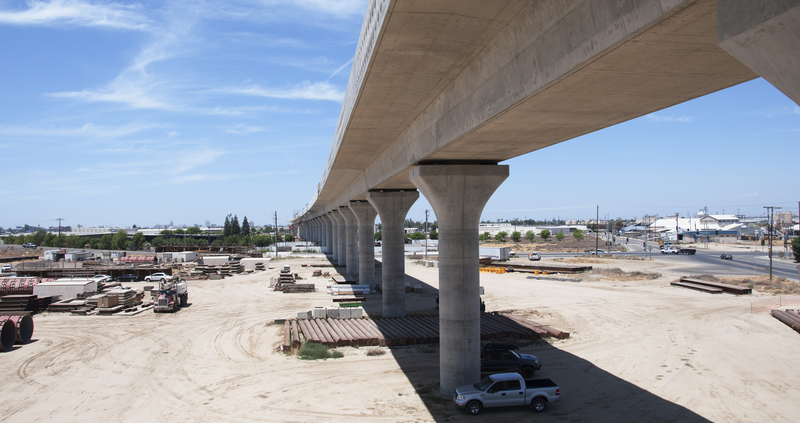 This money is thanks to SB1, a law that is estimated to provide $52 billion over the next decade to transportation projects. Keep that in mind when you vote in November. 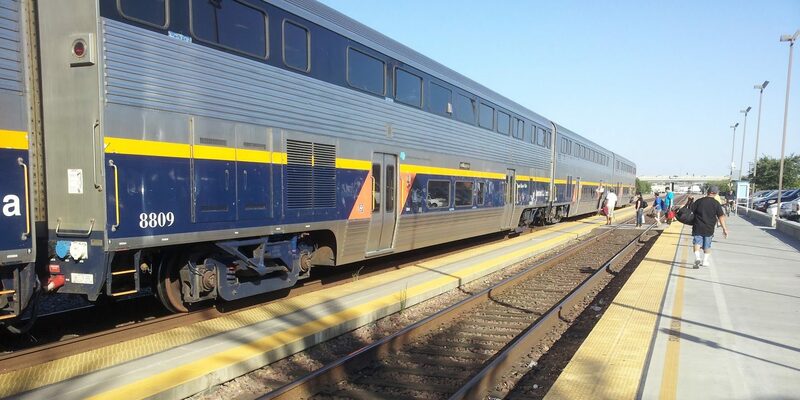 The state Thursday put another $500.5 million into expanding passenger rail connecting the Bay Area with Modesto and other inland cities. 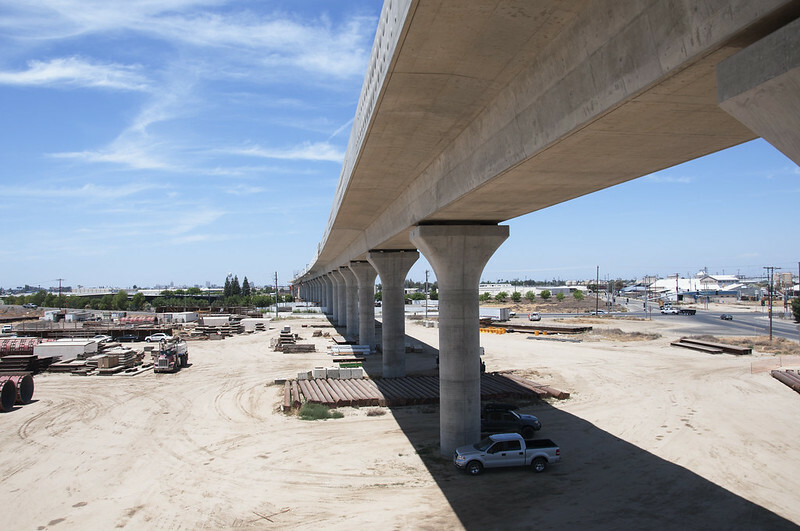 Some of the money will go to extending the Altamont Corridor Expresss, which runs between Stockton and San Jose by way of Livermore and Fremont. 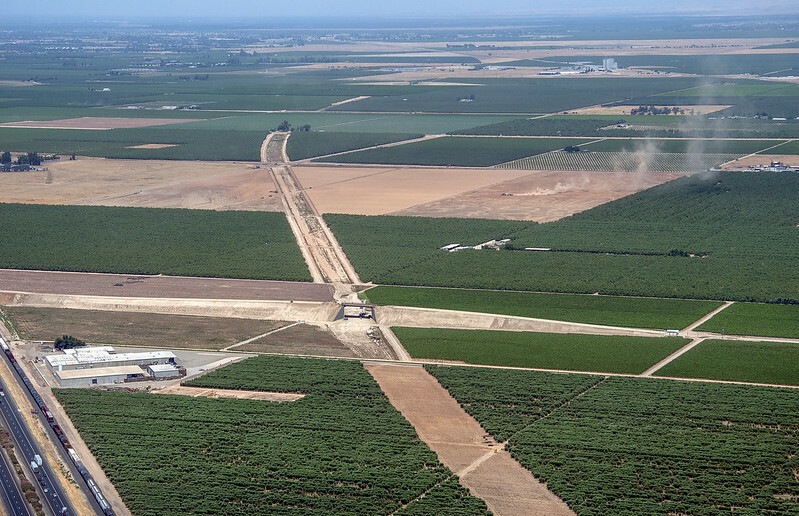 It could reach Ceres by 2023 and Merced by 2027 with this funding on top of $400 million allotted last year. 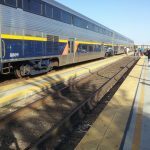 The $500 million also will pay for expanding ACE north to Sacramento by 2020, including new stations to be shared with the current Amtrak service in that corridor. All of the $900 million will come from the gasoline tax increase signed by Gov. Jerry Brown in 2017. The projects aim to provide comfortable rides for people who now drive to the Bay Area, where jobs are plentiful but housing is costly. 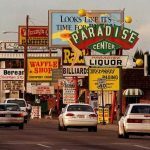 Modesto Bee Click to read more! There have been some changes since, but nothing too drastic. Frontier came back to Fresno, for example, and Reno gained an additional Jetblue destination. Personally, I’d love for Jetblue to add Fresno, but it seems incredibly doubtful. 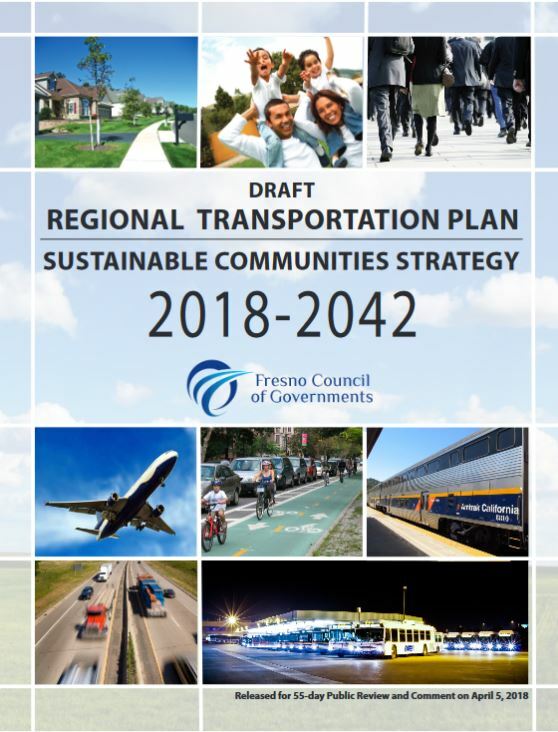 I was hoping that they would buy new planes and shift their older Embraer 190s to smaller markets like Fresno. Instead, they simply committed to replace their existing Embraer fleet with a larger Bombardier model and retire the older planes. That makes Fresno even less likely in their future, since each flight has more seats to fill. However, there may be some hope. 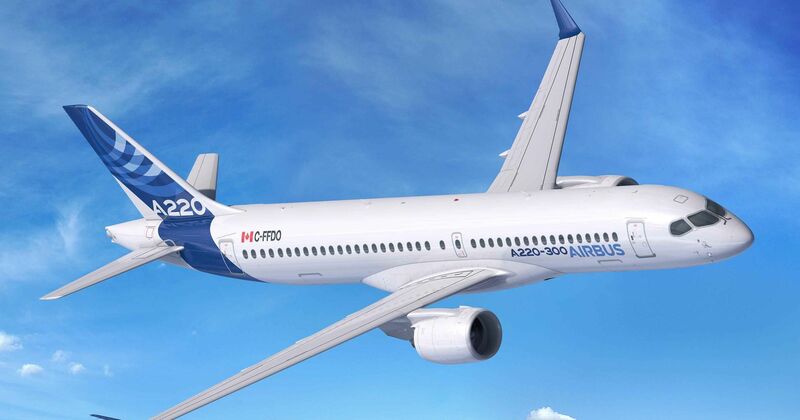 The guy who created Jetblue – and other airlines around the world such as WestJet in Canada and Azul in Brazil – is back to start a brand new airline. 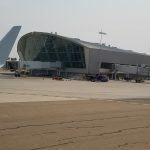 Unlike Jetblue, which began by focusing on major airports like JFK, Boston, and Fort Lauderdale, this new airlines is aiming for undeserved airports. This isn’t just an idea, he’s already signed up to buy 60 brand new airplanes. Travel and Leisure Click to read more! First a reminder. 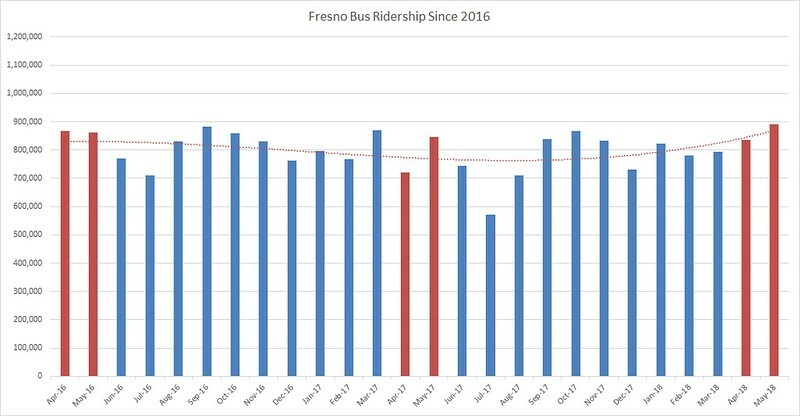 Here is what Fresno bus ridership looked like for ten years, from July 2008 to October 2017. Pretty scary. You can read my full analysis here. Now let us zoom in to the last 2 years. I have highlighted April and May of 2016, 2017, and 2018 to make an easier year-over-year comparison. Since the status quo was a continuous decline, even stopping that decrease would be a positive. Instead, the system has done better and shows ridership ticking up a notch compared to previous years. 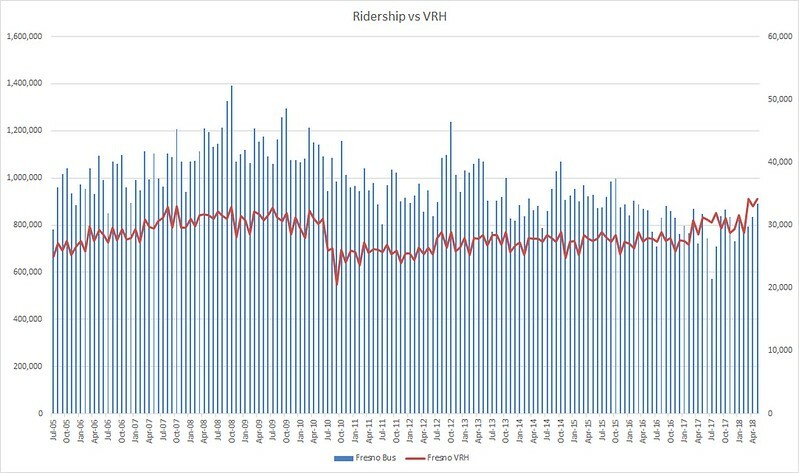 This next chart shows ridership plotted against Vehicle Revenue Hours (VRH) since 2005. The higher the VRH, the more time the buses are spending on the road serving customers. You can see that began to increase in 2017 when FAX introduced later hours and increased service on Shaw Avenue in advance of the Q rollout. This next graph shows ridership plotted against the maximum number of buses FAX runs at a given time (rush hour peak). I like it because it helps highlight how stagnant the system was for so many years. Once again, you can see when the initial FAX-15 rolled out on Shaw and Blackstone in advance of the Q service. This one also helps to show that even with this expansion, FAX used to operate more peak service in the past. 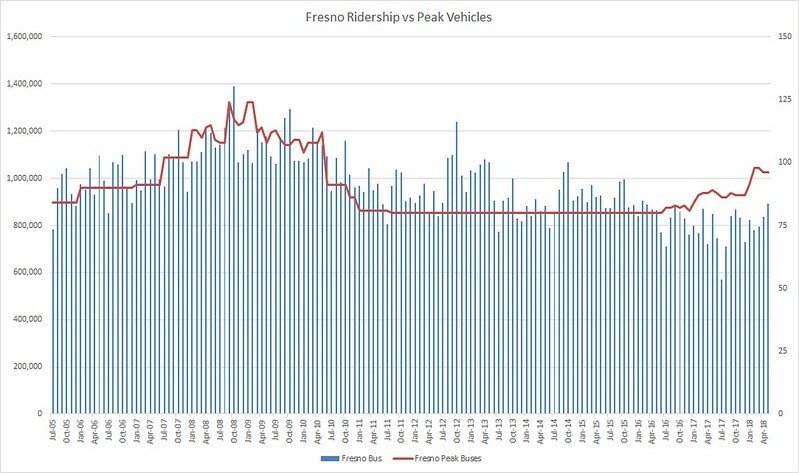 Essentially, they cut 3 routes and re-allocated the money to run those buses on other lines during other times of the day, which is why the previous graph does not show a marked decrease. Of course, I look forward to seeing this data again once we have a few more months to look at. 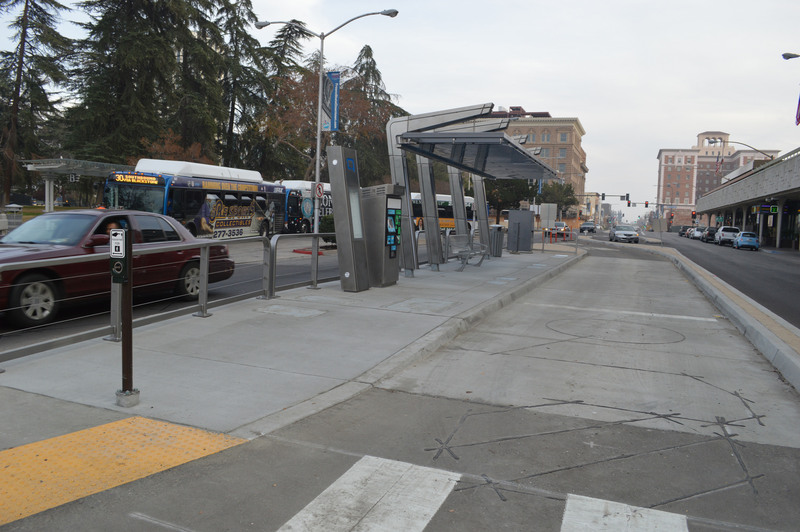 People do not respond immediately to transit improvements. If you bought a car because FAX service wasn’t getting you to work, it is hard to come back, for example. 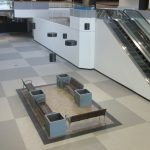 However, as people move and start new jobs, they might take a new look at FAX and realize that the improvements help get them to where they’re going, and at least for the near future, these improvements in service are guaranteed by federal funds. One question that will surely be brought up: What about gas prices? They have indeed been rising. However, that increase hasn’t yet resulted in improved ridership in the peer cities I track. 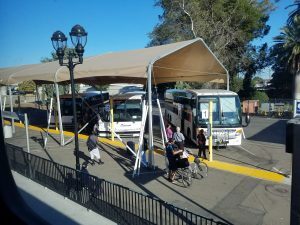 Modesto and Visalia are pretty flat, and Bakersfield is hard to compare with because they started counting their ridership in a new way in 2017. 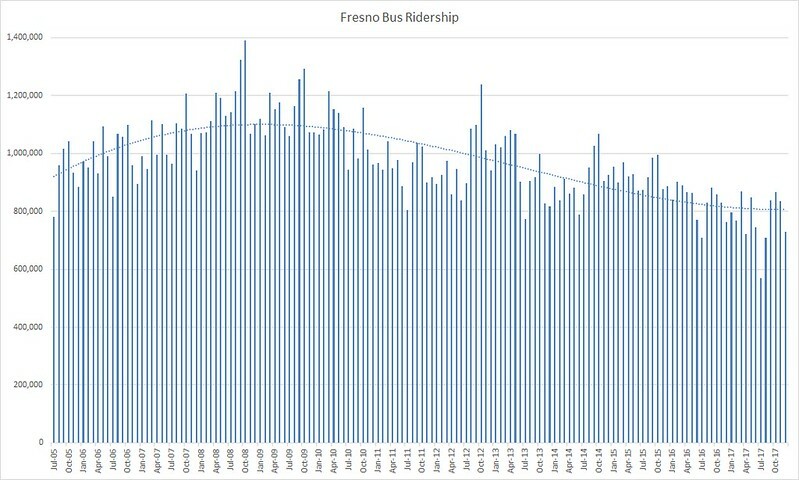 Across the country, I continue to read stories about how transit ridership is still falling as well. In conclusion, congratulations FAX, you have discovered that people like better service! 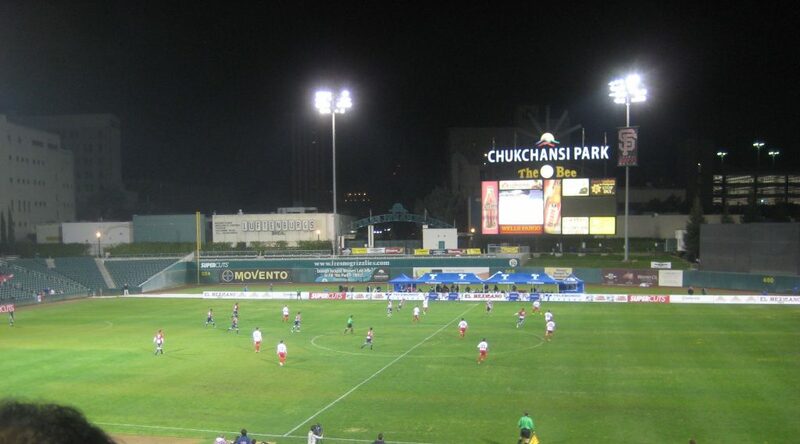 The First Round will feature all 52 amateur clubs with the 26 winners advancing to Round 2 (May 16) where they will be joined by all 22 United Soccer League clubs. Defending champion Sporting Kansas City and the rest of the Major League Soccer clubs will join the competition in the Fourth Round (June 4-5), where they will be joined by 12 Third Round winners. Click to read more!